BJP national president Amitabh Shah, who came to visit the Tirumala on Friday, ended the Karnataka legislative election campaign. Amit Shah, arrived at Thirumala in this morning, tried to block the Amit Shah. The TDP activists and the Shrivari devotees, including the public organizations, were also shouting slogans. When Amit Shah arrived early, the Tirupati residents came to Alipiri and said 'Amit Shah Go Back'. Amit Shah, who was unfair to the state, came to Tirumala. Concerns that the same has been forgotten by the Venezuela witnesses. The protesters wearing blackbirds were called Amit Shah Go back and TDP leaders and activists protested and joined the devotees on foot. The police, who had earlier protested the protests, had deployed large-scale troops in Alipiri and blocked the protesters. 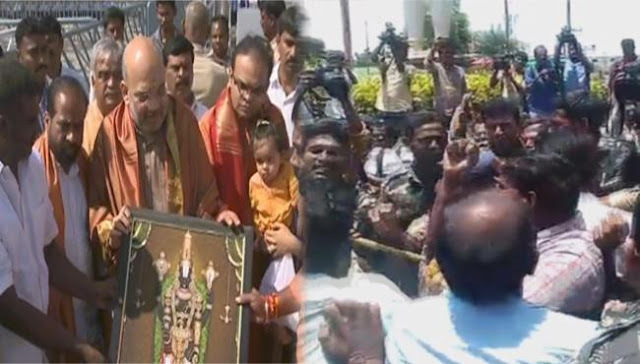 Amit Shah, who reached Thirumala from Alipiri, also welcomed the slogans of the devotees. If he was going to Convoy, the devotees next to the road were shouting for status. Taty officials, who are welcome to Amit Shah, made arrangements to make a pilgrimage by the protocol. Following Shrivari darshan, Shah tried to block again. There is a clash between the TDP and the BJP workers. Thus the glasses were damaged by protests against the BJP leader's vehicles. Amit Shah Reinigunta reached the airport between the strongest security.